Sometimes the impacts of our lifestyles pile up on one another and colletively cause much more damage than we’d expect. This applies to the combination of poor oral health and the consumption of too much junk food, in particular sugary foods and beverages. According to this article, a study published by the Journal of the Royal Society of Medicine indicates that this combination raises the risk of developing cardiovascular disease. 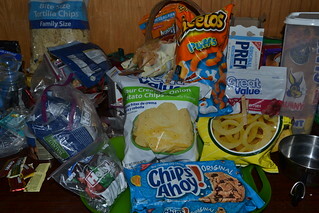 The sugar and carbohydrates in junk food, when consumed in excess by a person who pays little attention to maintaining good oral health, will likely lead to periodontal disease which in turn may lead to chronic gum infection, which may then lead to an inflammatory response and the onset of heart disease.